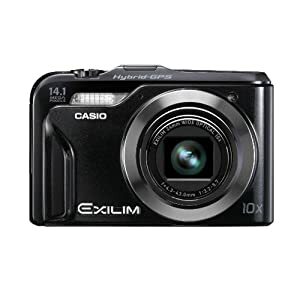 Casio Exilim EX-H20G 14.1 MP Digital Camera with Hybrid GPS (Black). The Casio Exilim Hi-Zoom EX-H20G Digital Camera With Hybrid GPS is the world's first digital camera with autonomic indoor positioning through Hybrid GPS. 1MP CCD sensor for high resolution photos, a 10x zoom lens (24-240mm equivalent), a Premium Auto Setting, built-in flash, image stabilization, ISO 3200 for low-light pictures, and HD video at 720p resolution. minimum) with this 8GB High-Capacity SecureDigital (SDHC) memory card. Take more high-resolution pictures faster (4MB/sec. The EX-H20G is equipped with a Hybrid GPS system that combines a GPS engine with autonomic positioning made possible by a motion sensor. The system sets a new standard for geotagging and offers exciting new ways to use a digital camera. With the new Exilim Engine HS, the EX-H20G features all of the essential capabilities expected from a camera. When used with Casio's Single Frame SR Zoom function, the 24mm wide-angle, 10x optical zoom lens actually offers a 15x zoom range that maintains the image quality needed for 14.1-megapixel high-resolution photography. The EX-H20G is equipped with a Hybrid GPS system that combines a GPS engine with autonomic positioning made possible by a motion sensor. Even if no signals are received from GPS satellites when indoors, the system consecutively tracks the user's location by employing an original algorithm using a three-way accelerometer and a three-way direction sensor. When the user goes back outside, the system automatically updates the positional information of the indoor location based on the exact location determined by GPS reception. Even when the camera is powered off, the GPS system continues to search for satellite signals at 10 minute intervals. Whether it's turned on, powered off or on standby in your pocket, the unique tracking and power control enables highly precise positioning without the time lag common with other GPS. The Casio Hybrid-GPS comes pre-loaded with world atlas data and information for nearly 10,000 sightseeing photo spots around the globe. Travelers can see photo opportunities around them and determine distance to those locations right on the LCD. Photos are labeled with the location and building name when available - making it even easier to remember where the shot was taken. Only Casio could find a way to pack a 10x Optical Zoom lens, large 3.0-inch monitor and a CCD Shift Image Stabilization mechanism into such a slim, compact camera body, just .96" thin, convenient for travel. With Ultra-Wide Angle starting at 24mm (35mm film camera equivalent) all the way up to 10x telephoto zoom, the photographer is ready for any scene.